Is there a war on Christmas? If there is, is it also a war on Christians? If it is, is it a war on the Christian faith? Who are Christians at war against? What ammunition is being used against Christians? What ammunition are Christians supposed to use? There is a cacophony of voices on TV, and social media telling Christians that we need to fight to keep Christ in Christmas. Do we? Or can we relax and enjoy this holiday season? Oops, Christmas season. I don’t have all the answers to the questions I’ve asked, but I do have some thoughts that might help us win the war (if there is one), and enjoy celebrating the birth of our Savior. First of all, I don’t think the Christian faith is under attack, at least not my faith. My faith is not placed in a holiday. My faith is not placed in traditions. My faith is not placed in the color or symbols on my coffee cups. My faith is not affected by the words that other people use to wish me a good day. My faith is placed in Jesus Christ – the one and only Son of God, who left the glory of heaven and was born as a baby. He lived a perfect life, died on the cross, was resurrected on the third day and lives, exalted, in heaven. Nothing can alter that reality, the assurance or the eternality of the Gospel in which I place my faith. Are we out of line to insist that total strangers, store clerks, advertising agencies and retail giants say, “Merry Christmas,” when they greet us? Is this how we keep Christ in Christmas? Are we fighting a war with words or are we fighting a war of words? Does it matter? Are we alienating possible future believers when we fight over words? What picture are we painting of Christians and of the God whom we serve by insisting on words? Are we inadvertently becoming the weapon of choice for the Evil One in his fight? Trust me, I get it, I want to keep Christ in Christmas, and I want the celebration of our Savior’s birthday to have the honor that it deserves, but, seriously, are we helping or hurting our cause by fighting with the tools we’ve chosen. If it is a fight worth fighting, perhaps we need to fight differently. Jesus overturned the money-changers in the temple, and yes, that was a holy and righteous anger – but is the anger that we direct at a sixteen-year-old barista, or an over-worked, underpaid single mom who checked us out at the grocery store and who failed to say the “magic words” truly holy and righteous? I’m not suggesting that we surrender Christmas, but I am suggesting that we fight differently than the world fights. Instead of getting angry with people who prefer to say “Happy Holidays”, why don’t we show love? We can fight to keep Christ in Christmas, but it doesn’t have to be ugly. Quite the opposite, I think it should be beautiful. We should leave a fragrance of life when we leave any shop, store or restaurant, rather than a stench of anger and self-righteousness. Could we take a few minutes to check our attitude before we demand that everyone else check theirs? 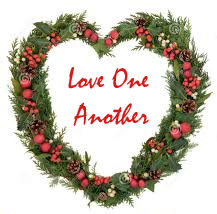 Could we win this “War on Christmas” if we fight with love? Our actions speak much louder than our words ever will. How will you demonstrate the love of Christ to everyone you meet this Christmas season? What Do You Need for Christmas? Thanks Marcia! I needed that kind of encouragement before writing my Christmas letter! Well-timed practical thoughts. Love the verse from Timothy. Thanks for using your writing gift to gently nudge our words back to a loving place. Amen! I hope you and your family have a happy and blessed Christmas. Thank you, and Merry Christmas to all of you! Great article, Marcia. The line that stuck with me most was “Shouldn’t the kindest words the retail clerk hears all day come from our mouths?” While it’s easy for me to be kind to retail clerks, I was convicted about other people I come in contact with that irritate me. Thank you! I agree with getting angry at front line employees or people that just choose not to say Merry Christmas but as a person who deals with businesses frequently I do have a problem and will not go quietly when workers are told NOT to say Merry Christmas and that is where we should speak out as Christians and Americans. Christ love does not mean lay your rights down at the door. Thanks for this perspective. I appreciate the Point! We live in a country where free speech is still guaranteed, as is freedom of religion.